This colorful periodic table wallpaper contains each element’s atomic number, element symbol, element name and atomic mass. There are two versions, featuring a transparent background and a black one. It’s all bright and cheery — just like you when you work chemistry problems, right? This table is optimized for displays with resolution 1920×1080 pixels, but is designed to resize according to your needs. It’s clean and clear when printed, too. The background is transparent to allow you to select your own background color. The element tiles are slightly separated, so it’s easy to read the element data. The color periodic table below is the same table with a darker background and white text on the labels. 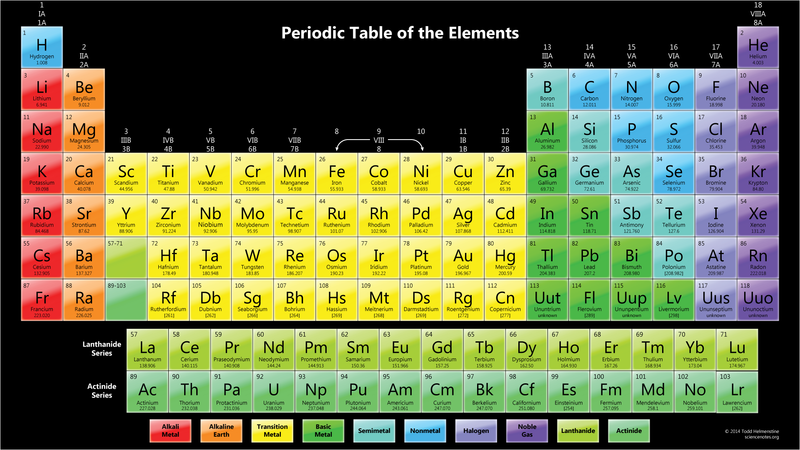 This element chart really pops as a screen background on mobile devices and monitors! It’s bright and easy to read the element facts. The sans serif true type font lets you shrink the table without loss of detail. Of course, this color table is only one of dozens we’ve created. You’re sure to find a chart that fits your needs. We’ve even got festive tables for the holidays. These make fun decorations or place mats, especially if you are throwing a lab party. Check out the other Science Notes colorful periodic table wallpapers. As always, if you need a table we don’t have, just post a reply or send a message.